125 records found. Page 3 of 13 displayed. Winter days like this can be deceptive! 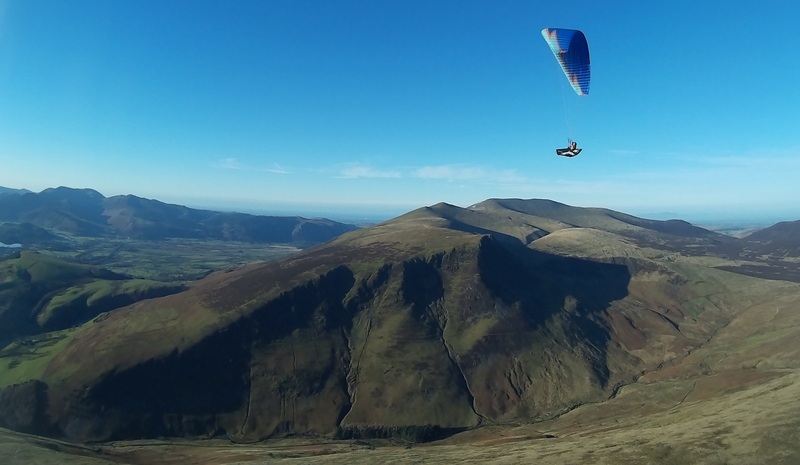 Pilots reported that the day had varying conditions and a severe wind gradient with 33-35 kt winds at the top of Blencathra, no wind on the normal "shoulder" take off and an appreciable westerly wind in the landing field. 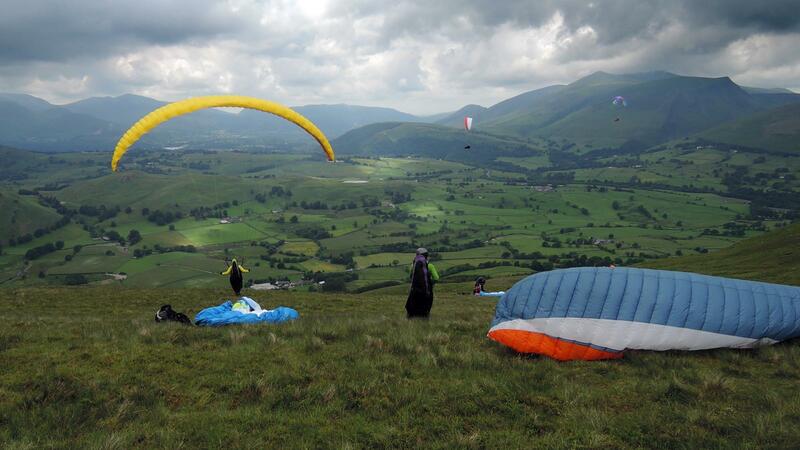 Dave Eva took the photo of Jackie Knights; take off was on Blease Fell on the slopes of Blencathra. The view looks to the west over the valley of Glenderaterra Beck to Lonscale Fell. The bulk of Skiddaw dominates the skyline. This November saw the sudden arrival of winter. From a fine October, we had a dose of rain from storm Angus; then the end of the month was dominated by fine, cold days. 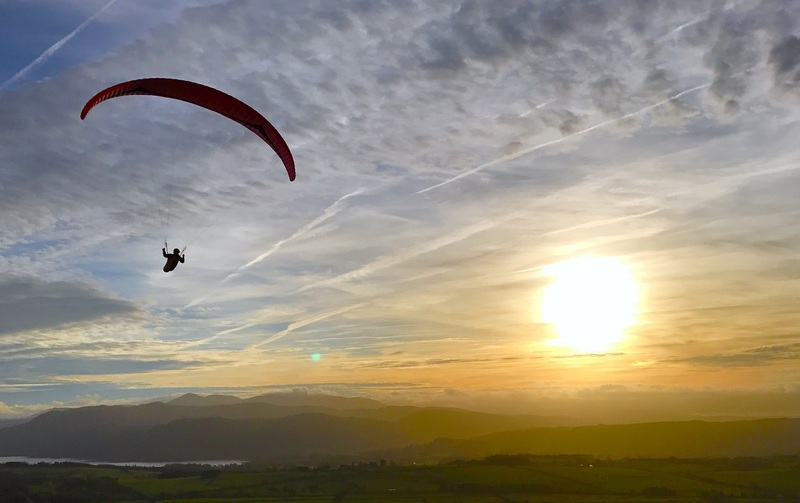 On 23 November, Dave Ashcroft and Paul Clarke were tempted to climb High Stile on the promise of a north easterly breeze. High Stile lies on the ridge between Ennerdale and Buttermere in the NE Lakes. Dave reports that it was quite a slog up through the snow and take off wasn't any better. 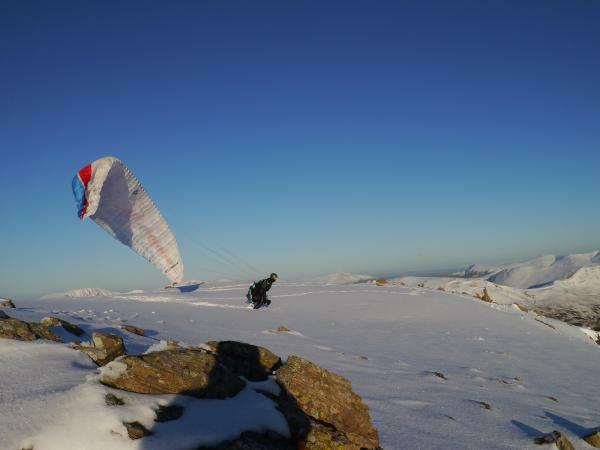 Here you can see Paul launching through the snow for a fly down - the promised breeze didn't happen. The view is to the north with the Skiddaw massif in the distance. The hills of southern Scotland can be seen. Photo by Dave Ashcroft. Autumn in the Lakes brings it's own form of epic flying. A number of pilots walked up Skiddaw on Sunday 30 October for a flydown to Keswick. Mike Harper took the photo and reports "There was a high but thin inversion layer at 700m to 800m asl. 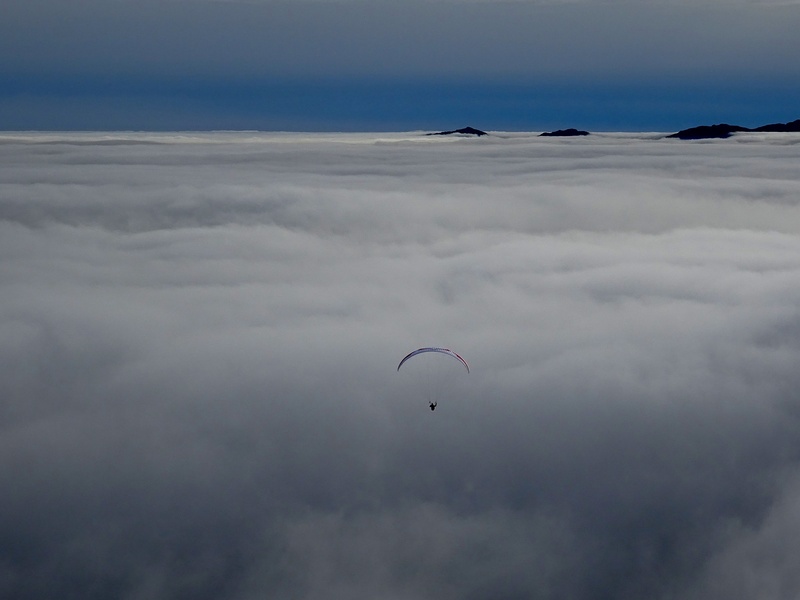 The air was nice and smooth as we drifted down through the cloud to land on the edge of town before heading for a debrief." Despite the forecast, this years Lakes Charity Classic saw 2 days of competition flying. On the Sunday, the flying started on Heron Pike in Grasmere. Goal was Ambleside with several pilots making goal. The wing is being flown by Baz Roberts and the photo looks east into the central Lakes. 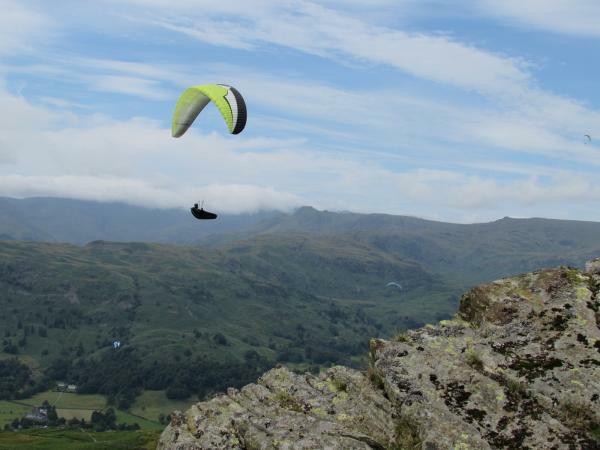 Harrison Stickle is the flat topped peak in the centre of the photo with Bow Fell and Crinkle Crags in cloud behind the pilot. Photo by Ed Cleasby. June 18 was an epic day at Clough Head in spite of the cloud cover in the photo. The coaching group got lots of airtime and the XC hounds managed to get down the Helvellyn ridge to Kentmere, Sedbergh and Kendal. The photo was taken by John Hamlett who says that it brightened up eventually! The view is looking NW from Clough Head with the Skiddaw massif dominating the right hand side of the photo. 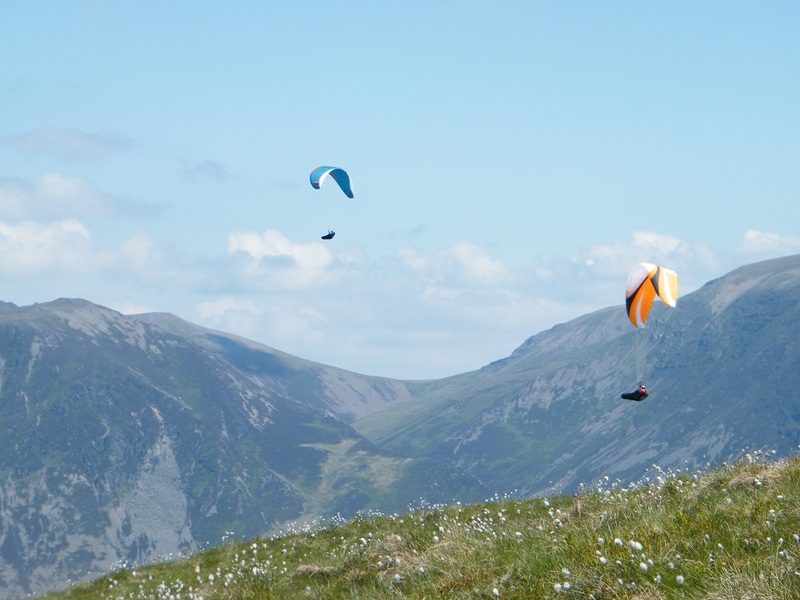 Burnbank is one of our north westerly sites and overlooks Loweswater. Pete Rycroft took this photo on Sunday 29 May. 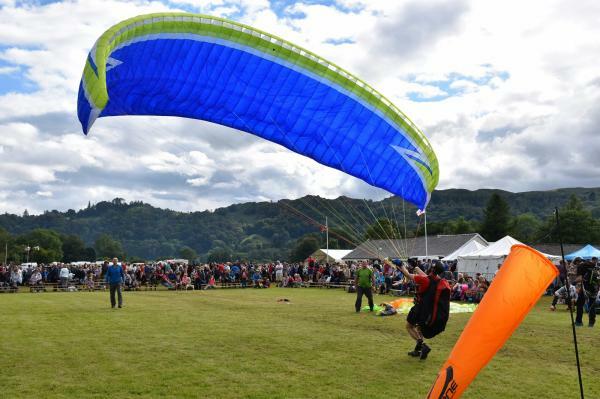 Chris Little is on the orange glider and we think that Peter Ridge is on the blue one. 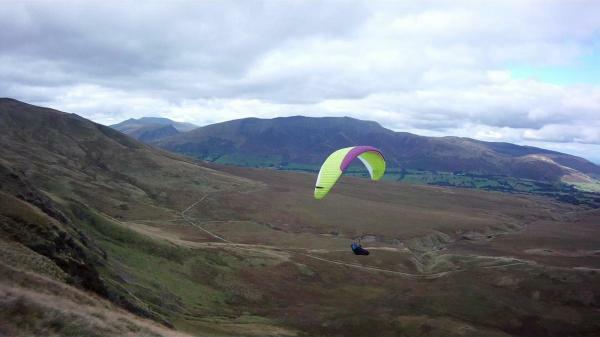 The view is to the east and Coledale Hause which lies between Hopegill Head and Grasmoor. 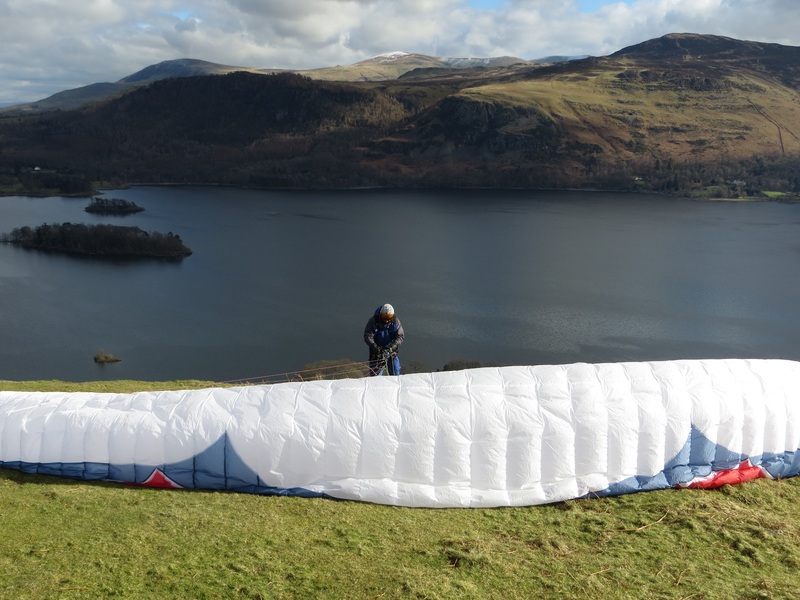 No photos received this month so its 28 February again with Tony Thompson about to take off on the east side of Cat Bells. Derwent Water is behind him and the Helvellyn ridge in the far distance. The photo was taken by Stewart Clark with many thanks.